J.W. 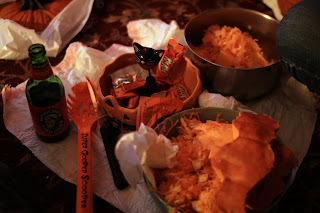 Ocker: Knife, Candle, Jack-O-Lantern! Noses and teeth are so last Halloween. October 25, 2011 — Throughout their young lives, we tell our children to keep away from knives and fire. But then, once a year, we give them both and tell them to go at it. With “it” being a cranium-sized orange fruit that most of us are more comfortable thinking of as a vegetable. Ah, jack-o-lanterns. You bring me closer to God. 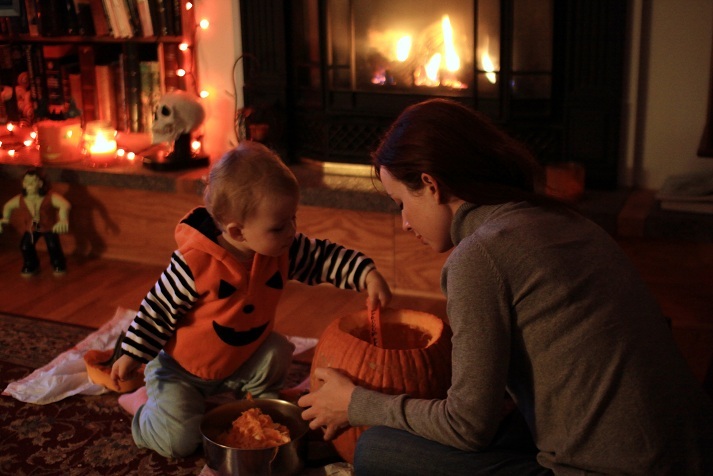 Jack-o-lanterns are the “preparation as celebration” part of the holiday. Like trimming the tree or cooking the turkey or painting the eggs. It’s not the center-ring attraction that is Halloween night itself, but it’s actually better because when you’re done, your anticipation level for the holiday is at its highest. As opposed to Halloween Night itself, since when it’s done, we’re like, “Eh, November 1st,” and then hit the snooze alarm. Of course, in the end, these leering orange globes that we slave over will get smashed on the street or tossed into the garbage or melt into Rotbert, but that’s as it should be. I mean, we could easily buy those carvable polyurethane pumpkins from the craft stores and keep our works and memories preserved every year, but that’s not the point. It’s to make something live just for a moment, to be as ephemeral and infernal and special as Halloween night itself. 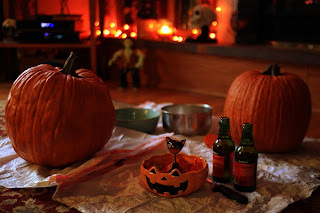 When my wife and I slice our pumpkins into bodiless skull cases, we have a few traditions. 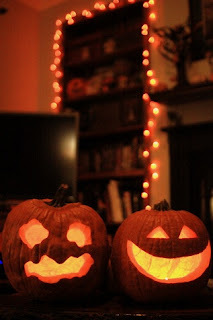 Like always forgetting the pumpkin candles, forcing us to throw handfuls of tea lights into their heads when we’re done. Another is to douse the seeds culled from the stringy innards with red pepper, salt, port, and Old Bay and then eat them until our teeth hurt. 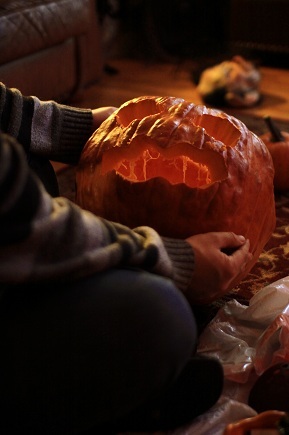 The most important tradition, though, is watching a movie while we carve. Well, half-watching a movie. We need to at least semi-focus on the serrated blades in our hands after all. As to which movie, it has to be something seasonal (a no-brainer, much like the jack-o-lanterns themselves), but we also need to care less about the plot. That way, it’ll invoke the feel of Halloween, making every random glance up a reinvigoration to keep scooping all the guts or painstakingly picking out all the seeds, while at the same time not distracting us too much with wanting to watch it. Last year, it was Tim Burton’s Sleepy Hollow. This year? Mad Monster Party?. Over the course of the 60s and 70s, Rankin/Bass Productions pretty much conquered Christmas with their stop-motion puppet specials. Three years after the first foray that was Rudolph the Red-Nosed Reindeer, they tried to pull a reverse Jack Skellington and do the same for Halloween. Mad Monster Party? was that failed attempt. The movie, like its Christmas counterparts, is stop-motion animated, and therefore has some of the charm. This time, it involves all the classic monsters getting together at the castle of their leader, a mad scientist voiced by Boris Karloff. The creatures learn there that he is about to retire, and each one wanting his power, tries to take out Boris’s heir, a puny, pharmaceutical-abusing kid voiced like a drunk Jimmy Stewart. Phyllis Diller also stars, playing the bride of Frankenstein’s monster, but, hilariously, the puppet-makers didn’t do anything to monsterize her physical appearance, instead recreating her as-is since she was apparently monster enough to hang with the likes of the Hunchback, the Mummy, and Mr. Hyde. Mad Monster Party? 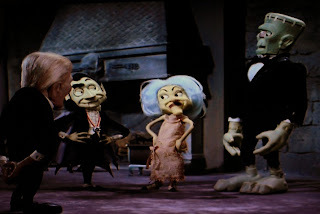 is cringe-inducing at many points, especially during the songs, but the atmosphere and the character designs of the puppets are great to see when glancing up from the orange carnage on your lap, even though I don’t remember Halloween even being mentioned in the movie. As to that orange carnage, the filled-to-the-brim bowls of leftover gobs and chunks meant that our surgeries were a success. I went with a lumpy-looking face on my jack-o-lantern because the gloriously grotesque shell of the pumpkin itself kind of dictated that. My wife went with a more goofy look because she’s prone to nightmares. They make a better couple than we do, I think. Like our child, it’s impossible for me to be objective about how they turned out. I just know that I want to put a live webcam on them so I can check in on them from wherever I am. They’re both looking at me right now as I write this. They love me. Or they want to feast on me in my sleep. 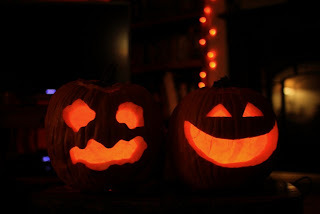 You can never tell with jack-o-lanterns.